Headquarters of the Rural Municipality of Abernethy No. 186. Village, pop 197 (2006c), 213 (2001c), is located east of Fort Qu'Appelle on Hwy 22 in the rolling countryside north of the Qu'Appelle Valley. Settlers began arriving in the area in 1882, the first travelling over land with oxen, teams of horses, and wagons from Brandon, Manitoba in the months before the CPR was built into present-day Saskatchewan. Many would ford the Qu’Appelle River north of Wolseley at the site that would become known as Ellisboro. A large number of those taking up homesteads were of British origin, coming both from eastern Canada as well as overseas; one of the earliest settlers in the Abernethy district was William Richard Motherwell, who would become the province’s first minister of agriculture, and a founder of the Territorial Grain Grower’s Association. The Motherwell Homestead, just south of Abernethy, is now a National Historic Site. For the first couple of years, travel south across the Qu’Appelle River to the CPR main line was often a wet, muddy, and difficult undertaking, a situation which was much improved with the construction of the first bridge in the summer of 1884. This still did not alleviate the travel distance necessary to deliver grain or obtain supplies however, and residents of the Abernethy district would petition authorities for many years for rail service. Meanwhile, though, the settlers went about building the foundations of their community. The post office was established in 1884, Christ Anglican Church was built in 1886 (two kilometres south of Abernethy until 1904 and now a municipal heritage property), and schools were popping up in the countryside from the mid-1880s. In 1903, the CPR built the railway grade through the district and the townsite was established. Buildings were moved in from the country and many new buildings were erected. In 1904, as the first trains rolled in, Abernethy was incorporated as a village. Within months the population was 300, and it hovered around that mark until the mid-1980s. At the end of WWI, citizens of the community decided to construct a memorial to those from the area who had served and died for their country. The Abernethy and District Memorial Hall was completed in 1921 to accommodate social, cultural, and recreational activities, and it was considered at the time to be the finest facility of its kind in the region. It was designated a heritage property in 1985 and the distinct local landmark is still in use today. The Abernethy Nature-Heritage Museum houses a collection reflecting both the community's pioneering era and the region’s natural history. For fishing enthusiasts, the museum also includes a display of Len Thompson's famous fishing spoons, 30 million of which have been produced since Thompson made his first lure in Abernethy in 1929. Thompson constructed a factory in Abernethy, but relocated to Lacombe, Alberta in 1958. 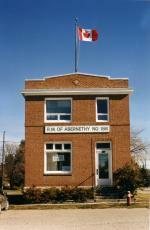 In July, 2004, the Village of Abernethy commemorated its centennial with a successful homecoming celebration. 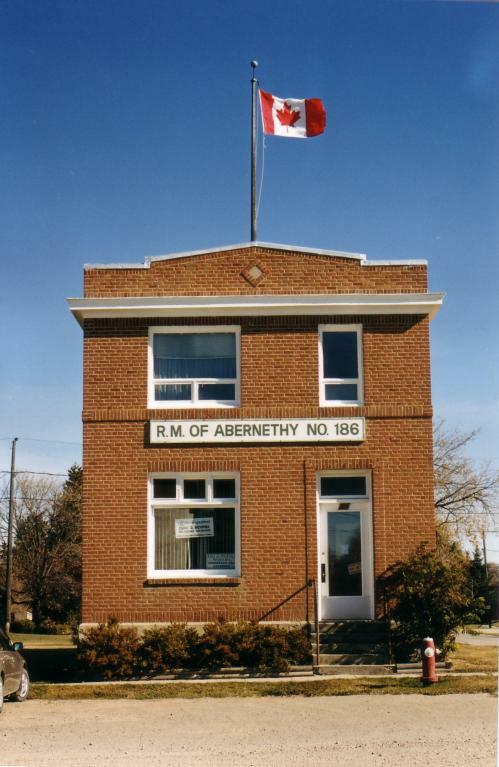 Abernethy serves as the administrative centre of the RM of Abernethy No. 186.